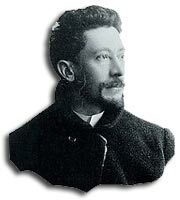 Art nouveau glass artist Emile Galle. His life and work. Galle was perhaps, the most innovative designer working in glass during the art nouveau period. Born in Nancy, France, in 1846, he is still considered one of the most outstanding glass artists of his time. He greatly contributed to the development of the art of glassmaking and to the Art Nouveau Style. He was following William Morris’s precepts before 1880 and was so inspired by Chinese cameo glass that he created glassware that was to influence Tiffany in the United States. He traveled in Paris, London and Weimar after his training, which included art, botany, and chemistry, and began producing fine pottery, furniture and jewelry. Galles’ father, who owned a local glass and faience factory, inspired Galle to enter the glass industry. This sparked his interest in glass as a medium for artistic expression. In 1873 Emile galle set up his own glass studio and a year later he took over his fathers glass and ceramics factory in Nancy. In 1878, he experimented with classical and enameled designs but his aspirations were dramatically expanded when he visited the International Exhibition in Paris. There, he was exposed to the cameo glass of Joseph Locke and John Northwood from England and Eugene Rousseau in pate de verre. In 1885, Galle opened a small woodworkers shop where he began experimenting in marquetry designs in furniture. In 1889, at the Paris International Exhibition, he presented his own new types of glass, including carved cameo and pate de verre work, new shapes of vases and extraordinary new colors. At the 1900 International Exhibition in Paris, Gallé had an outstanding exhibit with many fine pieces of glass and with a working glass furnace in the centre of his display He was highly acclaimed, and this experience was probably the high point of his career. EMile Galle was the head of l’ecole de Nancy membership of which was resticted to men who had achieved pre-eminence in their particular fields and included; the potter Hesteaux; the fine glassmakers, the Daum brothers; painter and artist Victor Prouve and Louis Majorelle, the outstanding furniture maker. Throughout the 1890’s in his "Cristallerie d’Emile Galle", he created new glassworks and employed a team of dedicated craftsmen-designers, who worked on his designs and applied his signature after he approved the work. In those years, he also exhibited his art nouveau works with great success, winning international awards and recognition through commissions and increased popular demand. The work of Emile Galle had a major influence on the art nouveau movement. Clear and enameled or stratified, applied, engraved, acid etched or wheel-carved, his glass was very elaborate. Nature inspired his designs, which were mostly floral some with foliage, or landscape decorations and some with a strong Japanese feeling. Galle developed a technique for the production of cut and incised flashed glass and enameled designs, enhanced by bright colors and transparency of the material. Galle also made vases and lamps in two distinct qualities of glass: his masterpieces, that took hours of precise work to make and his less expensive, though still very high quality art glass, that would later be called, industrial Galle. Galle continued to produce some superb qualit glass masterpieces until the final year of his life. Emile Galle died in 1904 and after his death, his widow continued to run the glassworks until the outbreak of war in 1914. The glass sold being marked with a star after his signature. The Gallé glassware, mainly made by acid etching on two and three layer cameo glass with landscape and floral designs, continued to be made until 1935, when the firm closed down. 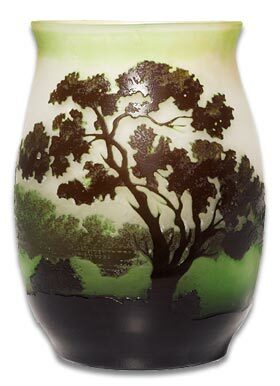 After World War I Paul Perdrizet, Emile’s son-in-law, began producing Galle glass once again, even adding new designs and primarily making the multi-layer cameo glass in floral and landscape designs. All Galle glass production ceased in 1936, however reproductions and fakes are still made in great quantities and tend to fool glass collectors that should know better. 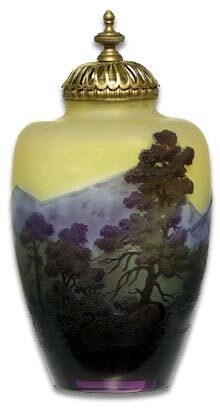 Major Galle works (from 1989 to 1904) included : … Glass vases and lamps, with cameo or wheel-carved Gallé signature, etched to depict landscape scenes. Flowers, butterflies or birds amongst foliage, in double or triple overlaid and etched glass; internally decorated, overlaid, wheel-carved glass; cameo glass; flashed, engraved, chased and enameled glass.